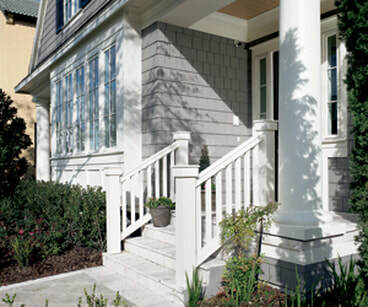 Fypon offers high quality PVC to premium grade polyurethane products that not only has a low maintenance appeal, but an easy to install and sophisticated appearance that will suit all your exterior millwork needs. 1. Lasting Performance and minimal upkeep compared to other materials. 2. Lightweight and does not require special tools. 3. Polyurethane smooth or textured - comes pre-primed and ready to paint or stain. 4. Closed-cell polyurethane is resistant to insects. 5. Ideal for moisture-prone interior spaces like bathrooms, kitchens and basements. 6. Beautiful and durable in all seasons, withstands the elements better than traditional matierals.